So I recently decided I was going to buy a Ukulele. This is possibly the most random thing I have ever done in my life... I have never played any musical instrument in my life(aside from the recorder in elementary school) and know absolutely next to nothing about strings or any instrument. All I know is that Ukulele's are awesome. This kid in one of my classes at sporadically brings his ukulele to school, and every time he played it I couldn't help but be happy. It's amazing. So I've decided to take a leap of faith and try to learn to play one. As my friend said: "It's impossible to be unhappy when you can play a Ukulele," so I can't help but think this is a good idea. Are there any fellow Ukulele players on here that can share anything? Paint it the way Scott Morse does. and have fun! I also want an ukulele, played it in highschool a bit and it was great fun, but when I saw this one I wanted it instead. Haha i really have absolutely no idea what kind it is. It was about 85 bucks and looks pretty sleek, although, I had to look, and yes, its made in China. -_- oh well. I've never tuned any string instrument before so I tried to yesterday with an online tuner to the best of my ability but its probably still really off lol. I haven't learned any songs yet, I'm still getting the feel of the whole thing and trying to memorize the different chords. Awesome, man! I've been playing the ukulele casually for about seven years now, so I was very excited when I saw this thread. 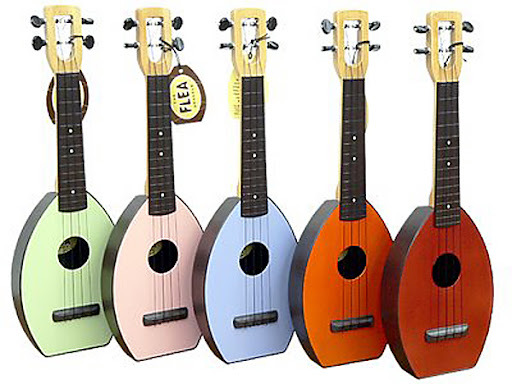 I myself have a Flea ukulele (shown below; I have the green one). It's a very nice beginner to intermediate level uke. What I recommend is finding some guys that you can play with, who can teach you chords and songs. That'll give you a better base of knowledge and experience that simply reading about chords and notes (though that does help, of course). hahaha yeah I figured I'd eventually have to get some hands on help... I'm going to try to teach myself as much as possible from youtube videos and the such but obviously nothing can replace in-person help. Considering I've never played a stringed instrument before, theres only so much I can teach myself (As of right now, I'm pretty much sure I can't even strum correctly lol). Once I get a hang of this thing, I don't play on ever being unhappy!!! haha. It's a good incentive to learn to play. Anyways, belows a picture of the kind of Uke I got. I have no idea what it'd be classified as, I think it's pretty slick, and it has a plug in. I bought a ukulele as a dare, I figured I wouldn't let my money be blown away and took a few lessons. It's fun to whip out at a party, let me tell you! Good luck with yours, keep at it. Ah, one of those guitar shaped ones. Nice! The guitar store near where I live has an ukulele room, and I've spent some time in there admiring all the odd-shaped ukuleles. The last time I visited they even had a bass ukulele. It had thick rubber chords for strings. It was about the darnedest stringed instrument I've ever seen. I "Thanked" this post, but then removed it when he started singing. I picked up a tenor uke on a trip to Kauai a few years back. awesome little instrument and so fun to play... way more casual than a guitar (and more portable too). check out ukulele underground for some tips on learning. Round the corner, on top of a hill is a house that I pass infrequently. They have ukuleles adorning their lounge - tons of them - and it never fails to make me smile when I see them. "It's impossible to be unhappy when you can play a Ukulele,"